Interested in learning more about New Literacies ? 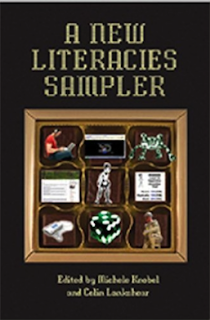 Lankshear and Knobel's book "A New Literacies Sampler (New Literacies and Digital Epistemologies)" is a must read in this direction. New Literacies is relatively a new movement that appeared a couple of decades ago. Proponents of this movement include celebrated scholars in the calibre of James Paul Gee, Colin Lankshear, Gunther Kruss to mention but a few . These scholars study literacy from a sociolinguistic perspective arguing that culture and society take supremacy in any study of literacy. They particularly view literacy as a social act that require immersion in social activity and hence to be literate transcends the conventional meaning of being simply able to read and write in the sense of encoding and decoding text to knowing how to use this text in specific contexts and for specific purposes. Lankshear and Knobel associate the notion of literacies with the two different mindsets: industrial physical mindset and post industrial cyberspacial mindset. People subscribing to the earlier mindset view the contemporary world as being the same world that existed during the industrial era only now it becomes more technologized and digitally sophisticated. On the other hand , people with the second mindset hold a different view of the contemporary world viewing it as radically different from any world we have ever known and this difference is attributed mainly to the different new ways of being, acting, and engaging with the environment that digital technologies have provided us with. The authors further argue that without the proper mindset , people " will approach the tools and environment of the digital technology revolution in inappropriate ways." In coming up with a definition of what constitutes a new literacy, Lankshear and Knobel draw on the dichotomy of web 1.0 and web 2.0. While the ethos of web1.0 are based on notions of centralized, official, expert-based and top-down classification management systems; web 2.0 celebrates features such as participation, collaboration, collective wisdom, non-expert bottom-up classification management systems. Accordingly, " the more a literacy practice privileges participation over publishing, distributed expertise over centralized expertise, collective intelligence over individual possessive intelligence, collaboration over individuated authorship, dispersion over scarcity, sharing over ownership, experimentation over normalization, innovation and evolution over stability and fixity...the more we should regard it as a new literacy." The book also provides a wide range of examples typifying these new literacies from video gaming to social activities involving mobile devices.